Nickel City Con and Buffalo’s historic North Park Theatre are proud to announce a series of exclusive screenings and Q & A’s this May centered around the convention and three celebrity guests – Jon Heder, Lori Petty, and Jason Mewes! Movies are a huge part of any comic book convention and Nickel City Con is proud to partner with the North Park Theatre again to bring you screenings of the best movies from our film guests! Our first screening together was Flash Gordon with the amazing Sam Jones in 2017 and it was a blast. Sam was great, and noted that the picture quality was the best he had ever seen of the Dino De Laurentiis production but the state-of-the-art projector is just the beginning of the film experience at North Park. 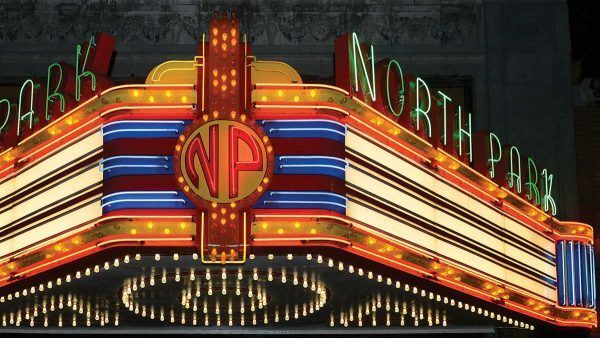 Painstakingly restored to it’s original glory the North Park Theatre is a true Art-Deco icon and Buffalo landmark, and still the best place to enjoy a movie in Buffalo since it’s opening in November of 1920! For 2018 we are excited to bring you the following films with Q&As by our amazing guests.The fun gets started on Thursday, May 17th starting at 9:30pm with Napoleon Dynamite and guest Jon Heder. Jon will be participating in a Q & A immediately after the screening. The first official day of Nickel City Con 2018 sees Lori Petty and the cult classic Tank Girl ‘tank’ over the theater Friday night. Lori will be participating in a Q & A before the film begins. Finally on Saturday night Jay himself, Jason Mewes, will be on hand for the debut film from his BFF Kevin Smith – Clerks! Jason’s Q & A will be before the screening as well. We hope you’ll join us for one – or maybe all THREE of this year’s North Park screenings. Tickets are available through the link below, don’t delay as seating is limited and also, the first 100 tickets for each screening come with a free Friday night pass to the Con. So get yours early and thanks for supporting your local theater!